Vintage wordpress template is a cool and unique vintage design. The header graphic is filled with all sorts of stuff, like for example an old vespa scooter, some ancient books laying next to the scooter, in the center there is something resembling a flat screen tv and on the right side we have 3 small banner placeholders. Above them there is a search box. The blog’s pages links are just above the header. Overall this is a two column wordpress theme with sidbebar located on the right side. It is wordpress widgets compliant. 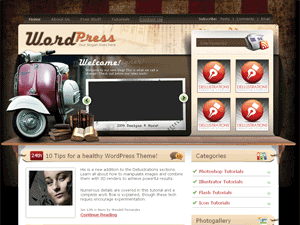 Vintage wordpress theme was designed by Dellustrations.